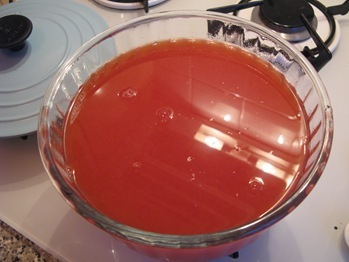 Argh – why is it that jelly is such a royal pain in the arse to make? Every single recipe I’ve tried gives a specific number of gelatine sheets to use, and the jelly never EVER sets. The recipe I tried below (tsk tsk Nigel Slater) was no exception – it took three attempts to get it right. I thought I was going mad, effing and blinding and stomping around my kitchen in the early hours. I mean, how many flipping sheets of gelatine does one jelly need? Apparently the confusion occurs because chefs use a different size of sheet, but my gripe is that food recipe editors should realise that ordinary punters wouldn’t use catering sized ones. We just buy the regular Supercook ones in the supermarket. Anyway. Rant over. 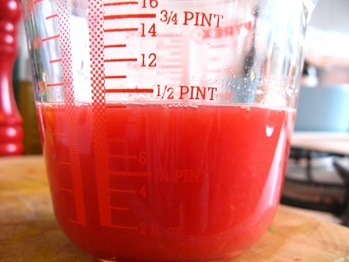 A really great fruit to make a jelly with is the blood orange. 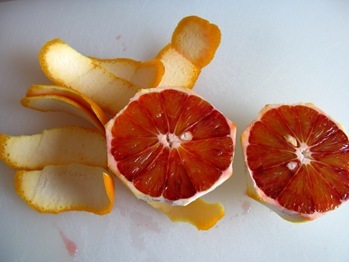 Blood oranges are in season right now. Don’t hang about, though – you can only get them for a couple of months a year, and they’re really worth snapping up. Really nice ones, I think, come from Sicily – you can get great organic ones from small growers there. In terms of flavour, blood oranges are slightly more perfumed than regular oranges; some have dark red flesh, others are a mottled mixture of red and orange, and some are just orange coloured on the inside. Part of the fun is unpeeling one to see how dark the segments are inside, then squeezing out the vivid juice. 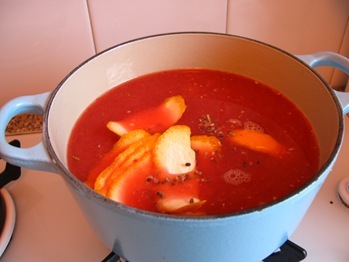 The only clue on a blood orange’s skin that the inside might be red coloured is a little red blush or mottling, otherwise they look exactly the same, albeit a bit smaller than normal oranges. Uses? You can make a very grown up vodka and blood orange cocktail (fresh juice and voddy) and in terms of desserts I got the idea to make a posh fruit jelly for a dinner party. Jelly is such a great pud to make for a dinner party – it wibbles on the spoon, feels nostalgic, but if you make your own with fresh fruit juice, it’s very grown up! This jelly came in very handy when I had to provide the pudding course at a mate’s dinner party (a sort of pot luck supper where everyone brings a course) because you can carry it across London on the tube in your bag and it won’t break or spill, it’ll just wobble amusingly. Bash open the cardamom pods in a pestle and mortar and extract the black seeds. Juice the fruits, then put the juice of the oranges, grapefruit, lemon and lime in a stainless steel saucepan, add the cardamom seeds, sugar and the strips of orange peel. Stir until the sugar has dissolved, taste to check it’s sweet enough, if not add a bit more sugar, then bring almost to the boil before turning off the heat and putting the lid on, letting the liquid cool down for about 20 minutes. Meanwhile, soak the gelatine leaves in water until floppy, then when the juice mixture has cooled down a bit (but still warm) add the gelatine to it and stir until dissolved. Pour the jelly mixture through a sieve to remove any seeds or peel, into either moulds, wine glasses or a large bowl and leave to set in the fridge overnight. You could serve the jelly on its own, or with some nice shortbread and a blob of vanilla ice cream or double cream. Normally I would have put the jelly in individual glasses or moulds, but as I had to carry it across London, a big bowl had to do. Tastes the same, innit! I have a wonderful film playing in my head with the trials and tribulations of transporting a jelly on the tube! Very Charlie Chaplin. Well done! I also enjoyed you rant. Too right.